Weighing boats are typically made from polystyrene, paper, and aluminum materials. As a result, due to their inexpensive and disposable nature, they are often used for the measuring and storing scientific material. Although weighing boats are very simple in their design, they are still one of the most crucial pieces of equipment. What most Scientist and researchers don’t know is that a weighing boat has a plethora of uses besides its namesake. Can be used to cover dust samples. Determine the moisture level of a sample. Used in several food processing applications. Are resistant to aqueous solutions, alcohols, and bases. Able to be manipulated to the researchers needs. Provide easy dispensing of samples into narrow containers. 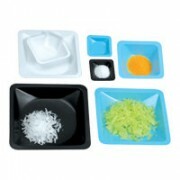 At Pipette.com we pride ourselves in offering the best variety and price on all of our products. Our weighing boats are no exception! 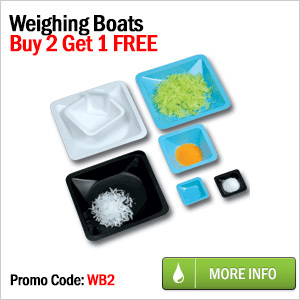 With purchase of 2 packs, you will receive one pack of weighing boats for FREE! Other weighing boats are currently discounted up to 25% off, our weighing boats are sure to meet all of your laboratory needs. To learn more about the various applications of a weighing boat or to find the right product for your research facilities’ needs, contact the experts at Pipette.com.